Nokia Bell Labs, Deutsche Telekom T-Labs and the Technical University of Munich (TUM) have achieved unprecedented transmission capacity and spectral efficiency in an optical communications field trial with a new modulation technique. The breakthrough research could extend the capability of optical networks to meet surging data traffic demands. 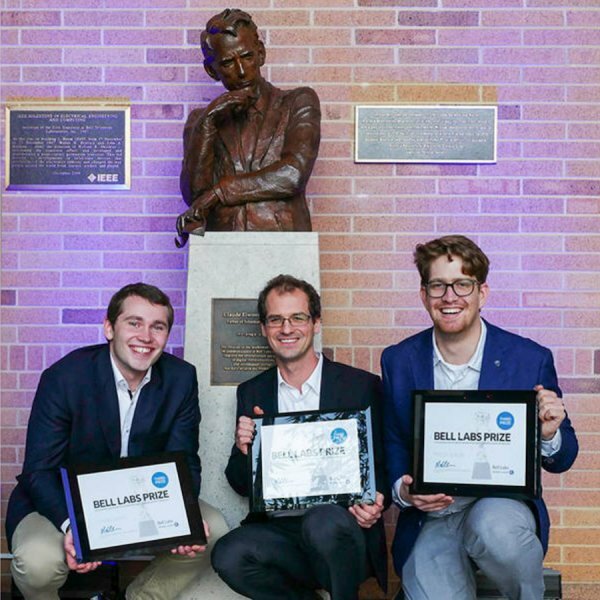 TUM researchers (l-r) Fabian Steiner, Georg Böcherer, and Patrick Schulte with the statue of Claude Shannon, father of information theory. In an optical communications field trial, Nokia Bell Labs, Deutsche Telekom T-Labs and the TU Munich showed that the flexibility and performance of optical networks can be maximized when adjustable transmission rates are dynamically adapted to channel conditions and traffic demands. As part of the Safe and Secure European Routing (SASER) project, the experiment over a deployed optical fiber network of Deutsche Telekom achieved a net transmission rate of one Terabit. The trial of the novel modulation approach, known as Probabilistic Constellation Shaping (PCS), uses quadrature amplitude modulation (QAM) formats to achieve higher transmission capacity over a given channel to significantly improve the spectral efficiency of optical communications. PCS modifies the probability with which constellation points — the alphabet of the transmission — are used. Traditionally, all constellation points are used with the same frequency. PCS cleverly uses constellation points with high amplitude less frequently than those with lesser amplitude to transmit signals that, on average, are more resilient to noise and other impairments. This allows the transmission rate to be tailored to ideally fit the transmission channel, delivering up to 30 percent greater reach. It was 50 years ago when optical fiber was introduced. With the promise of 5G wireless technology on the horizon, optical transport systems today continue to evolve to help telecommunications operators and enterprises meet network data traffic growing at a cumulative annual rate of up to 100 percent. PCS is now part of this evolution by enabling increases in optical fiber flexibility and performance that can move data traffic faster and over greater distances without increasing the optical network complexity. The research is a key milestone in proving PCS could be used in the future to extend optical communication technologies. The results of this joint experiment will be presented at the European Conference on Optical Communication (ECOC) 2016 in Düsseldorf, Germany on September 19. “Information theory is the mathematics of digital technology, and during the Claude E. Shannon centenary year 2016 it is thrilling to see his ideas continue to transform industries and society,” said Professor Gerhard Kramer, Head of the Institute for Communications Engineering at Technical University of Munich. Story Source: Technical University Munich.